Comments: Expensive, but exquisite, for many years GHQ microarmour has definitely been the best 1/285 - 1/300 miniatures available. Their quality is being rivalled by others now though, and at considerably lower cost. 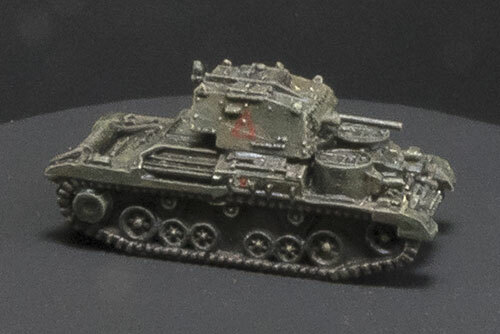 This is the first of the British "Cruiser" tanks to go into mass-production, the A9. It was a flawed design and doctrine, though both the tank and the doctrine went through continual development throughout WWII, culminating in the first Main Battle Tank, the brilliant Centurion. The A9 mounted a pair of sub-turrets on its hull front armed with Vickers .303 machine-guns. They were cramped, difficult to operate, and largely ineffective, and they were done away with on its successor, the A10. Curiously, the concept made a brief reappearance on the Crusader 1, before again being discarded.